With cruise passengers losing interest in the Caribbean, the cruise lines need to do something to make the region more alluring. 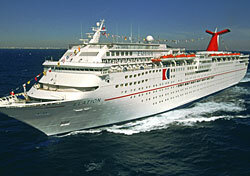 Carnival’s solution? Improve facilities at a relatively new cruise port. The cruise line will build a new cruise terminal on Roatan Island, Honduras, at a cost of $50 million. Construction is scheduled to begin in 2007 and finish by summer 2009. Named Mahogany Bay, Carnival’s new terminal will be able to accommodate two mega-ships and 7,000 passengers a day. Onshore, a welcome center will feature shops, restaurants, and bars, and the complex will also include a 60-foot-high lighthouse, lagoon with waterfalls, and a nature trail. Adjacent to the buildings, a transportation area will provide facilities for taxis, tour buses, and rental cars. Although Carnival doesn’t say it, I’d guess the rationale behind this project is to lure the experienced traveler back to the Caribbean. Cruisers who are bored with traditional ports-of-call, such as St. Thomas and Jamaica, may perk up at the chance to visit Honduras or other new ports, such as the one Carnival recently built at Grand Turk. Will it work? Time will tell. All I know is I’d be excited to visit an island off Honduras, new terminal or not.